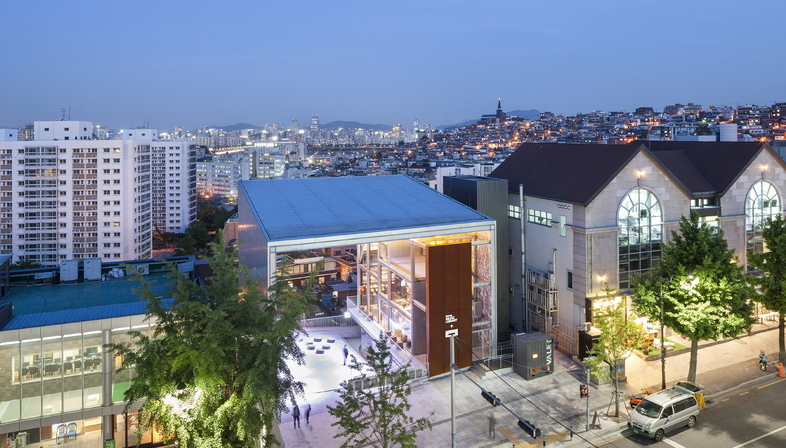 In H Music Library in Seoul, Moongyu Choi and Ga.A Architects have built a landmark establishing new urban connections. 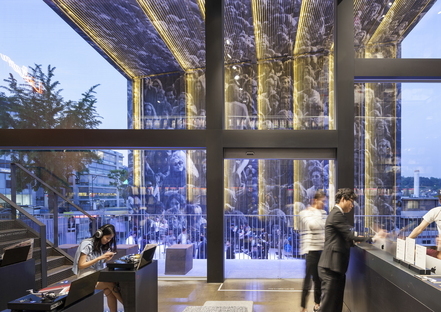 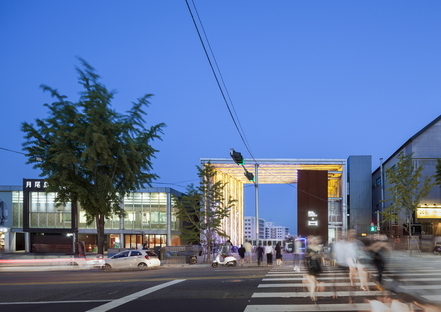 H Music Library, commissioned by Hyundai Card, offers passers-by on the Itaewon-ro an unusual view of the city. 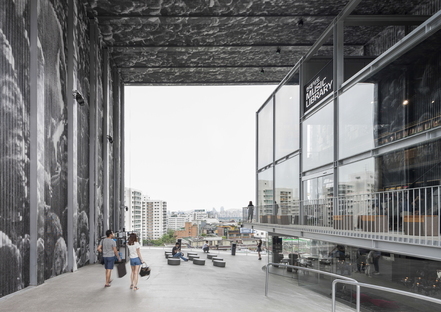 The H Music Library in Seoul is a landmark expressed by the subtraction of volumes rather than their addition to the urban scene. 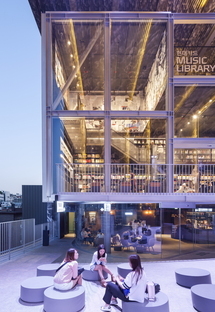 Moongyu Choi and Ga.A Architects interpreted this ambitious project, proposed by Hyundai Card, for a music library in the centre of the capital city of South Korea, as a turning point in the city, breaking with the perception of continuity in the city space. 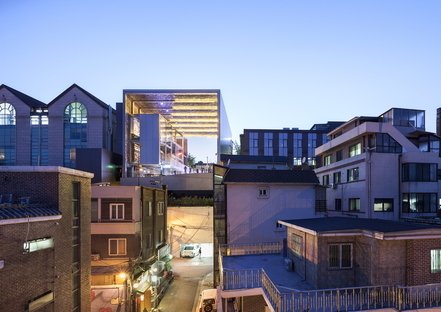 Major traffic arteries lined by towering skyscrapers and smaller streets of residential buildings often guide the eye while at the same time limiting the view. 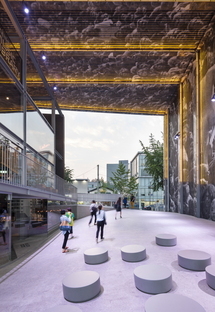 Moongyu Choi and Ga.A Architects experimented with breaking down these limits in Seoul, offering passers-by unexpected new views to alter their perception of urban spaces. 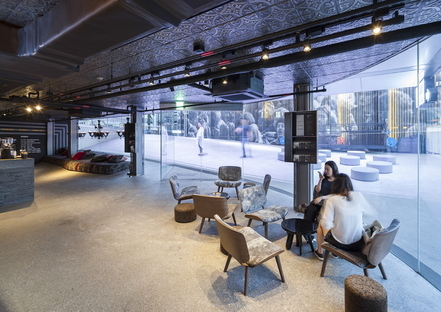 Commissioned by Hyundai Card, a credit card company, as a place for providing members with services, the H Music Library is located on Itaewon-ro Road, where the city slopes down toward the Hangang River, the Gangnam district and Gwanak Mountain. 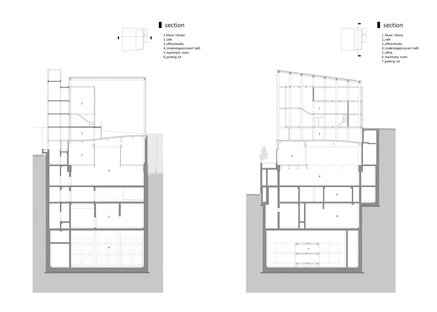 The architects realised the potential of the view and decided to work by subtraction, opening up a break in the architectural scene presented by the road. 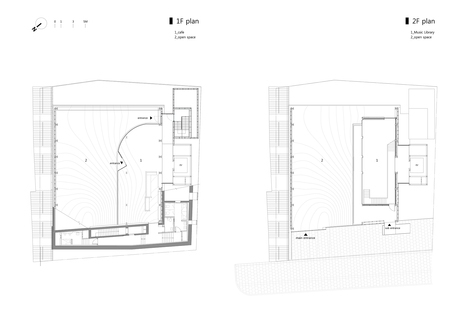 They demolished the previous building, choosing not to stitch back together the break thus created but drawing an empty space, a frame circumscribing a space, which is for all intents and purposes a belvedere, overlooking the hill and the view of the city. 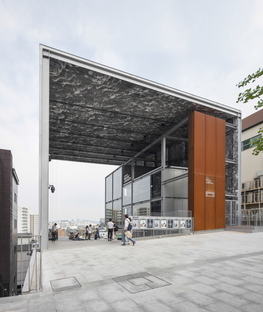 This space/non-space, outdoors yet indoors, an observation point over the city but also the entrance to the H Music Library, is the frame in which visitors are welcomed prior to entering the library itself, a double-height space above ground. 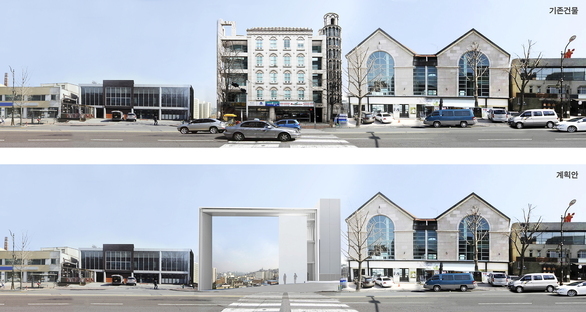 This is the solution adopted by the architects to open up an urban space while at the same time building the music library, a place where people can go beyond the appearance of the buildings to perceive the site’s urban dimension, its horizon, the morphology of the land, the principal sites for orienting oneself in the big city of Seoul. 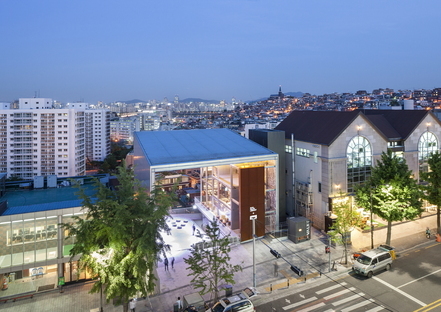 Following the natural slope of the land, the “plaza” framed by the glass and steel structure of the H Music Library it is in turn slightly sloped, from the Itaewon-ro down to the patio over the river. 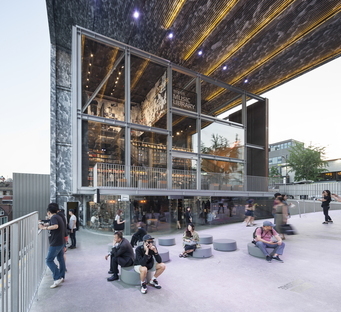 Here, a series of casual seats encourage use of the space as a public meeting-place, where events, happenings and outdoor concerts can be held. 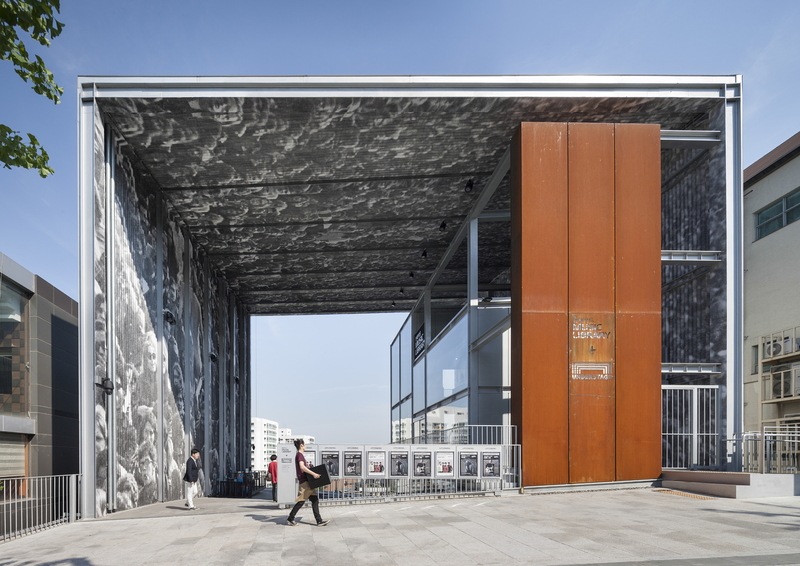 On the southern side, a corten and glass volume forms the entrance and foyer of the music library, while the two underground levels contain a 500 seat concert hall, little rehearsal rooms for musicians and lastly parking spaces.